Ambrosia is a creamy fruit salad loaded with pineapple, mandarin oranges, coconut and miniature fruit-flavored marshmallows. Happy Thursday! If you caught my post last Thursday, you know that I shared a recipe for Eric’s grandma’s Chocolate Glazed Donuts. If you’re not sure about #tbt, it’s basically a weekly Twitter and Instagram “holiday” that compels people to share photos from an earlier time in their lives. We’ve been going through cookbooks, recipe clippings and handwritten recipes, trying to gather a selection of our favorites to share with you. 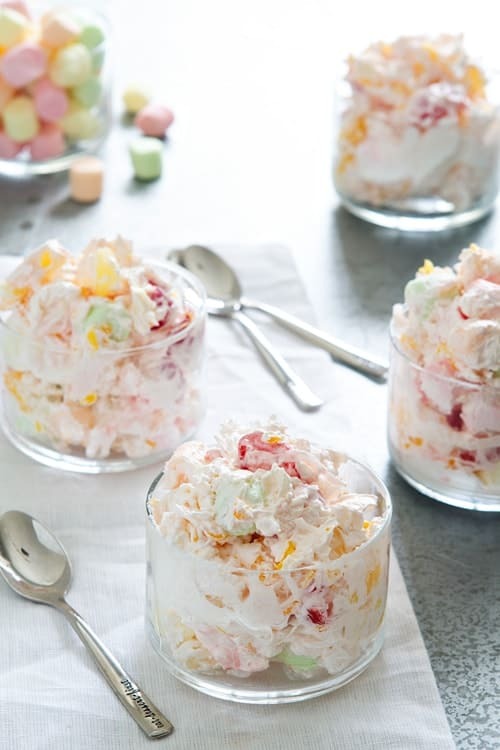 Today’s #tbtrecipe is Ambrosia Salad. 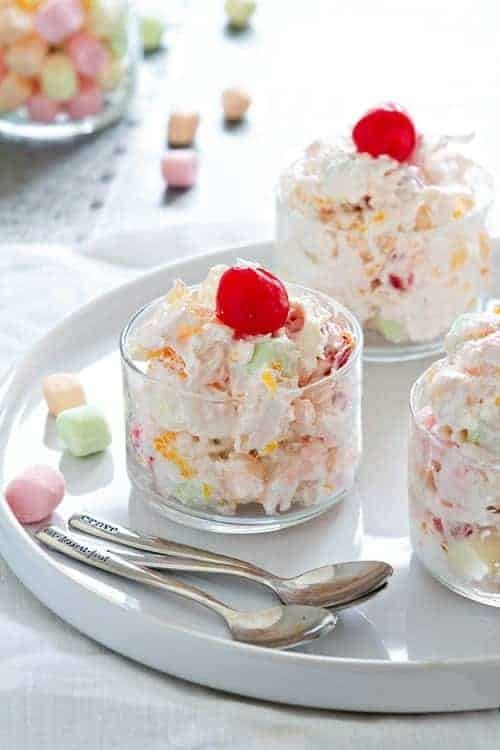 I fondly remember my Nana making Ambrosia Salad for pretty much every church function. The only problem was that we couldn’t find her recipe. Total bummer – I know. 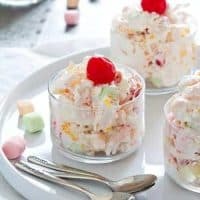 My aunt came across an Ambrosia Salad recipe in Nana’s church cookbook, but we knew it was not the one she used because it contained cottage cheese. And Nana’s most definitely did not contain cottage cheese, we knew that she used frozen whipped topping. Naturally I decided to start tossing ingredients into a bowl until the Ambrosia Salad tasted similar to Nana’s. And with a little tweaking, I most definitely succeeded! Ambrosia is a spin on a traditional fruit salad that typically includes pineapple, mandarin oranges, coconut, nuts and miniature marshmallows. Instead of using regular mini marshmallows, I decided to use my absolute favorite marshmallows ever – Campfire® Mini Fruit-Flavored Marshmallows. They’re soft, fluffy and oh so fruity, so I thought they’d be the perfect compliment to this Ambrosia recipe. As you may remember from my Pumpkin Spice Marshmallow Treats, I’m partnering with Emily from Jelly Toast and Campfire® Marshmallows. You’ll see more recipes from us, and hopefully even more exciting stuff as the year goes on. Be sure to check out Emily’s post for Fruity Marshmallow Popcorn Bars! Marshmallows + popcorn, how could that possibly be a bad thing? If you are not a fan of mainstream frozen whipped topping, you can find all-natural alternatives at Whole Foods or make your own. Disclosure: My Baking Addiction has teamed up with Campfire® marshmallows to share recipes using their products. This is a sponsored post written as part of that program. All opinions about Campfire® marshmallows are 100% my own. This is such a classic and yours is SO gorgeous! Thanks so much for stopping by, Valerie! I appreciate you taking the time to comment. Happy Baking! what a classic! we totally grew up on this in the 80’s! Thanks so much for stopping by, April! It’s definitely something 80s kids will recognize. I appreciate you taking the time to comment. Happy Baking! Could I substitute another canned or jarred fruit for the marachinos? Hi Emily – Sure, just make sure to drain whatever you use really well before folding it into the Ambrosia Salad. Hope this helps! Thanks so much for stopping by, Kristen! I appreciate you taking the time to comment. Happy Baking! Thanks so much for stopping by, Donna! I appreciate you taking the time to comment. Happy Baking! Do you use regular or greek yogurt? Hello! I use regular vanilla yogurt. I have not tried this recipe with vanilla Greek yogurt, so I am not sure how it would work with the thicker/tangier Greek yogurt. If you happen to give it a try, I’d love to know how it turned out. Happy baking! This is such a classic yummy dish! Thanks so much for stopping by, Christy! I appreciate you taking the time to comment. Happy Baking! What a delicious treat. We really enjoyed this. I am going to put this on my Easter menu! So happy to hear you enjoyed the ambrosia, Beth! Thanks so much for stopping by and leaving your feedback! This belongs at every potluck and family gathering!